I didn't end up having as good of week as I had hoped. Finding the time to work out with a baby is HARD! There were several times where I actually got as far as putting on my sports bra and either Jillian's nap ended earlier than I had hoped or something else came up. For whatever reason, we started buying them while I was on maternity leave and they seem to be a staple lately in our household. We are never without a bag. They are just so yummy!!!! I try to keep my servings to a minimum and will eat them with a veggie sub to offset the calories but who am I kidding? They are awesome! One complaint is their new biodegradable bag. Good for the environment, bad for a sleeping baby. I can't even begin to tell you how many times I have tried opening up a bag of these chips with Jillian sleeping in her swing. The bag is that loud that her eyes will spring open just from touching the bag. Why does a bag of chips have to be loud just to be bioderadable? I am also excited that I feel like I can finally shop for clothes for myself and that will actually fit now and when/if I lose a few more pounds. I am loving the ruffles trend lately. I can't get enough of them, I seem to gravitate towards any tops with ruffles on them. How cute is this shirt from Target? I am totally going to date myself here, but does anyone else remember the Outback Red line from the Limited back in the 80's? Well they brought back that name brand this year. Here is an adorable Outback ruffle halter. They have certainly come along way since the long bulky sweaters that I used to own of theirs!!!!! I also got this adorable Banana Republic dress at the outlet malls this weekend. I can't wait to wear it! Check back in next Tuesday for another Weight Loss Challenge Update. Cute shirts! I love that one from The Limited and actually I saw it over the weekend. Congrats on your loss so far! I totally remember the Outback Red brand at The Limited! I laughed out loud when you talked about their bulky sweaters. The halter is adorable. I am going to have to check out the line again! Girl, you are so brave! I commend you for blogging about this, that takes guts for sure! And I love the shirts, so cute! I loved Outback Red. I love all your cute finds, especially that dress. I want one! :-) And I agree, those biodegradable bags are LOUD! I agree about those biodegradable bags they are horribly loud! Way to go on your weight loss, it seemed like for me the first 30 lbs just fell off and there are still a few pounds hanging on for the ride, mostly in my belly area. love that dress from Banana! Actually, all three of your choices look great! Love love love all the clothes especially the BR dress...so adorable! Good for you for getting out and walking. I've been running and it's soooo hot! Take a picture when you wear the dress! I'm lovin ruffles too! I just ordered a couple of shirts from J Crew and they all have ruffles! That BR dress is super adorable - it's nice to have some good inspiration to motivate us to stay healthy! Cute clothes and I hate those bags too! We're on the turkey sandwich for dinner weight loss plan. 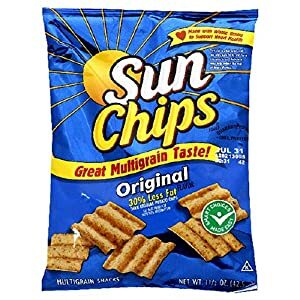 So we have to be careful with our Sun Chip bag too. It can wake Jackson up too! I can't believe it either! Our girls are growing up way too fast!! Cute outfits! I love the ruffle trend too, it's so feminine. I agree it's hard to find time to exercise while working and having a baby. Good thing is, you could run with your baby in a jogging stroller once they are 6 months old, which is soon! My daughter always loved going for rides and would usually fall asleep too. OMG, I do so remember the Outback Red line!!! I had no idea they brought it back. What a blast from the past! I am guessing they no longer put their tag on the outside!?Ha! HaHa! I was just in Limited the other day and literally laughed out loud about the Outback Red line. I love that ruffle halter but they didn't have it in my size. I am ruffle-crazy lately, it's an expensive obsession I tell ya!